I dropped by GE’s Kids Day in downtown Albany today before rushing home to watch soccer (No. I don’t want to discuss it. ), and it was a delightful event. Seriously, if you’ve ever gone to the Tulip Festival and thought, gosh, this would be more fun if there weren’t All of These Freakin’ People, then this is the event for you. I feared–and perhaps others did, too–that the hot sun slamming against all that white concrete would make it horrible. In fact, the girls stayed behind to go swimming with Cute W. But most of the activities were on shady little patches of grass that I hadn’t noticed before. 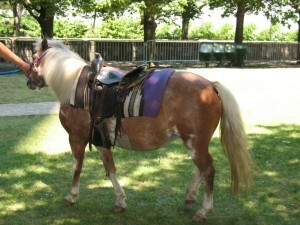 Plus, free pony rides! To paraphrase Jerry Seinfeld, who skips an event with ponies to go to a non-pony event? Apparently, many people, because it was pretty quiet while I was there. There were several bounce houses, performers, and experiments with cheerful GE helpers, making it an excellent destination for, say, the 10-and-under set. There are Valleycats games Monday through Wednesday. 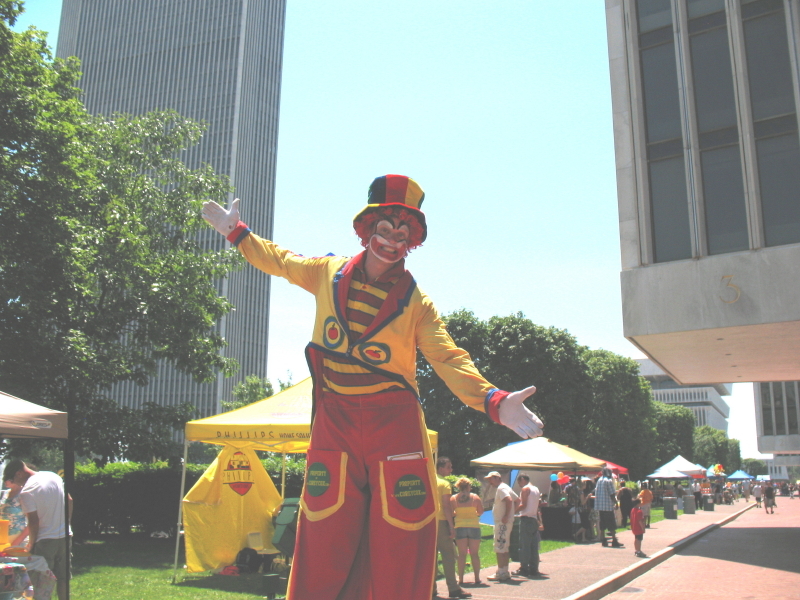 The Colonie Library has lots of summer programs all week. It’s the Saratoga County Fair July 19th to 24th. The Troy Library has several programs–click the link or check comments below for details. It’s a drop-in Tot Time from 1-2 pm at the Clifton Park-Halfmoon Library. For infants to aged 24 months and their caregivers. Bowtie Cinemas in Schenectady is showing Ramona and Beezus for free today and tomorrow. Doors open at 9:30 am, movies are at 10 am. Regal Cinemas in Crossgates is showing Alpha and Omega and the Tale of Desperaux today and tomorrow at 10 am. Tickets are $1. Learn about Animals Around the Globe at 2 pm at the Guilderland Public Library. At 10 am kids 3 to 7 can learn about A World of Music at the Clifton Park-Halfmoon Library with Lisa Russo. Registration is required. Kids 8 and up will work together to make Balloon Race Cars at 3:30 pm at the Children’s Museum of Science & Technology. Register, and it’s $2/non-member. At 6 pm there’s a free concert at Troy Riverfront Park. TS Ensemble are playing at 6:30 pm at Cook Park in Colonie. Bowtie Cinemas in Schenectady is showing Ramona and Beezus for free today. Doors open at 9:30 am, movies are at 10 am. Regal Cinemas in Crossgates is showing Alpha and Omega and the Tale of Desperaux today at 10 am. Tickets are $1. Ruth Pelham’s Music Mobile will be at Central Park in Schenectady at 10 am. This is a free, kid-friendly concert. From 2-4 pm, there’s a Storytelling Workshop led by Albany City Council Member Leah Golby at the Albany County DA’s Community Justice Outreach Center at 11 Clinton Avenue. Reserve a spot by emailing cab@albanycounty.com. There’s another tomorrow, and two more next week. It’s Alive at Five at Albany’s Riverside Park. The Audiostars (party rock) are playing at 7 pm at Freedom Park in Scotia. There’s country music at the Town of Niskayuna Gazebo at 7 pm. The Zucchini Brothers are playing at 7 pm at Clifton Commons Park (at this link it’s page 12 of 24). There’s a concert at 7 pm at the Bethlehem Public Library. At 10:30 am it’s Bubble Science at the Children’s Museum of Science and Technology. This program’s for ages 6 and up. Pre-register; it’s $2/non-member. It’s Jazz on Jay at noon in Schenectady. From 2-4 pm, there’s a Storytelling Workshop led by Albany City Council Member Leah Golby at the Albany County DA’s Community Justice Outreach Center at 11 Clinton Avenue. Reserve a spot by emailing cab@albanycounty.com. There are two more next week. Sonny and Perley are playing at Wiswall Park in Ballston Spa at 6 pm. There’s jazz at 6:30 pm at the Crossings in Colonie. There’s folk music at 7:30 pm at Tawasentha Park. The Not So Common Players are performing Cinderella at 7:30 pm at Clifton Commons Park (at this link it’s page 12 of 24). It’s Free Ice Cream Day as part of the FANS Summer Series at 1 pm at Kelley Park in Ballston Spa. Good morning, Katie. I’m glad you enjoyed GE’s Kids Day. The website I sent you lists an array of free or kids in free activities that GE is sponsoring. I hope you’re able to make it out to some. Please feel free to let your readers know about us. The Troy libraries have a bunch of stuff going on this week. At the main branch, there’s a middle eastern food thing on Tuesday at noon for kids 7 & up (you have to call to register), Ellen Sinopoli is joining their Story Time on Wednesday at 10:30 (this isn’t noted on their website, but I saw a flyer last week) and Rosey the Reading Dog will be there on Thursday at 3:30 PM. At the Lansingburgh branch, kids (all ages) can make their own sundae at 2PM. And they have a new thing on Tuesdays where kids 7 & up can make a craft to go with their Summer of Reading program. Yes, Bill, I’ve been telling people about free stuff as we go along, but reminders are always helpful. Thank you! Thanks, Erin. I’ll pop a link up into the “All Week” section, too. Oh, DANG! In fact, I know I had the Middle Eastern feast in there–I managed to accidentally delete it. Argh! So weird – because I checked the post 3 times thinking I had read it in there before seeing it on their FB page!